In 1995, when I was living in Chicago, I noticed something strange...despite the fact that the Jordan-led, Jackson-coached Bulls were well launched on an historic roll, every time I watched them play, they lost. Sports people would see meaning in such a thing, but sports people are superstitious, and superstitions aren't real—are they? Well, this afternoon I decided I should probably watch the undefeated Chicago Bears play, just so I could say I'd seen them. After all, what if they ended up going undefeated all season? It would be nice to be able to say I'd seen them. I live in Wisconsin now. My strange effect as a hex on Chicago sports teams had to be a thing of the past, right? After all, the Bears were playing the lowly Miami Dolphins today. Even the Packers beat the Dolphins last week, and the Packers, this year, would have their hands full against the University of Michigan. even though I almost never watched Cubs games. 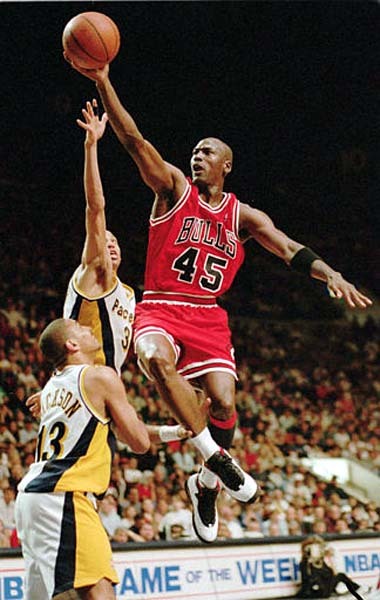 The result made me remember the last time I saw Jordan's 1995-96 Bulls. My Chicago friends, being superstitious, were constantly after me not to watch Bulls games. These curses take strange forms, they insisted. But the Bulls were setting records, and I really wanted to watch a game. Just to be safe, I decided to watch them play at home, against a hapless team that was in the cellar of the NBA at the time. I ended up seeing five games in the 1995-96 Bulls season, in which the Bulls went 72-10 for a record that still stands. In the five games I watched, they were 0-5. Including, of course, the game in which the lowly Hornets snapped the Bulls' 44-game home win streak. Bears fans, I swear: no more Bears games for me this year. Don't watch the Patriots play the colts tonight!!!! Please find something else to do next Sunday night, Mike. Please. I think you're being a little too quick with that pledge of yours. As an ex-Detroiter, could I get you to go to the next Lions-Bears game? Looks like Denny Green was right about the Bears! Did you peek at that Patriots game last night? Yes, I saw the Colts-Patriots game last night, but I've never identified in myself any ability to curse Boston teams.